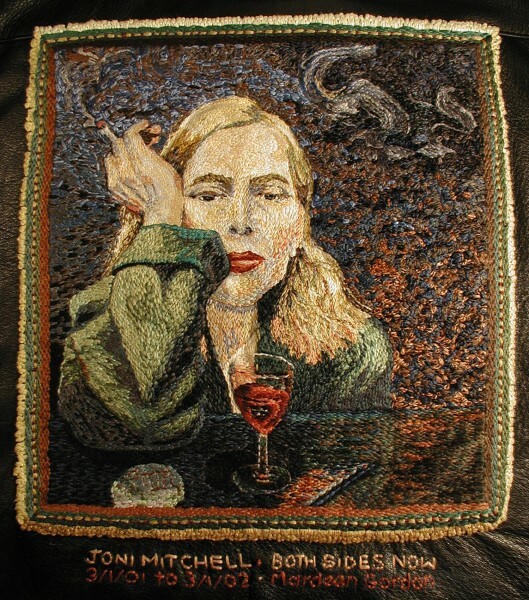 This tribute to Joni Mitchell was created at the request of a friend, who saw the other two jackets and wanted one of her own. She chose the Both Sides Now album cover because she is a huge fan of Joni's art and music, and I was happy to oblige. The image is 9"x9.5" and this time, I kept track of every minute from start to finish. Again, the image was transferred with the help of the computer, but the nuances of color and detail still require careful studying of a printed version. The floss is separated into three strands for the skin, two strands for the hair, and all six strands for the jacket, tabletop and background. In many places, I separated and recombined two or more different colors to blend them more smoothly. This piece was started on March 1, 2001 and finished on March 1, 2002, with a total of 330 hours of actual needlework.